Benevolent and wealthy John du Pont (Steve Carrell) has patriotic aspirations. He offers Olympic wrestler Mark Schultz (Channing Tatum) the use of his estate to build a USA wrestling team for the Olympics in Seoul, 1988. Some things are too good to be true, some offers are too generous, and some people have too much money and very little to occupy their time with. Foxcatcher is a film that deals with one such man, John Du Pont. He is a member of America’s wealthiest family and his life is one of a spoiled child, although he has now grown up. He summons people, he forces them to do his bidding, and he is a man used to getting his own way. Du Pont has a strained (and strange) relationship with his mother and his life, although wealthy, doesn’t seem particularly enviable. In fact Du Pont is a man who has done very little to deserve his lot in life and his inherited reality is something that he struggles to reconcile with his aspirations of being good at something. In contrast to Du Pont is wrestler Mark Schultz. Mark is a young man who is very talented at wrestling. He trains with his older brother Dave (Mark Ruffalo) who is also a wrestler. It runs in their family and both are at Olympic standards in their field. Their talent is apparent and their close friendship marks them out as a pair that work best together. There is however the suggestion that Mark is in his older brother’s shadow. It is in this subtext that Mark and Du Pont share a perspective on reality. Both feel that they are not truly recognized on their own merits and instead rebel against their perceived influences. For Du Pont it is his mother and for Mark it is Dave. In this they find some common ground and when Du Pont offers Mark the opportunity to hand pick and train the USA Olympic wrestling team he jumps at the offer. Dave however is less inclined to uproot his family and so the two brothers pick different paths. 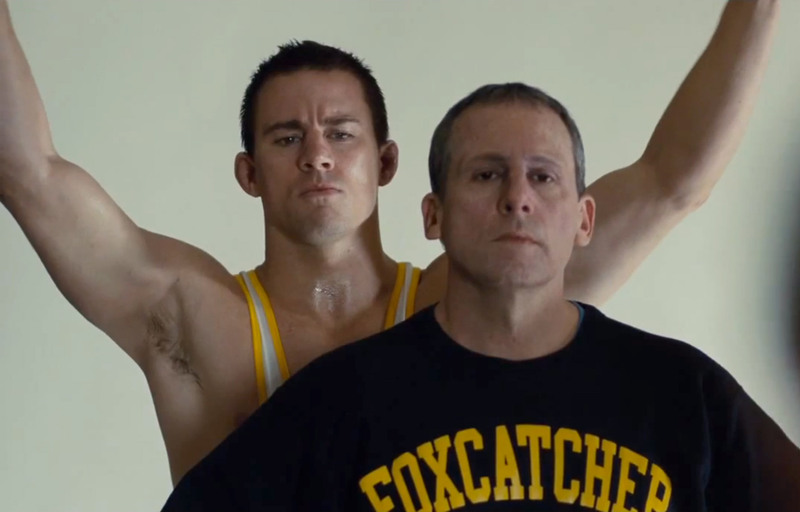 The underlying drive in Foxcatcher is that of people trying to find their place. In fact it runs deeper than that and the desire of the two main characters is to stand on their own feet and to be seen for what they have accomplished. It can be hard however for someone with a chip on their shoulder to feel satisfied as their work and achievements can be attributed (in their head at least) to another. Foxcatcher then is a film about people in the shadow of others and people trying to determine their own self worth. The problem however is that those people find their sense of worth from other people ensuring that they are always seeking approval. This is true of both Du Pont and Mark. They find a sense of peace with each other but it is a false start, a promise that will be broken, and a relationship based on unhealthy needs. The acting in Foxcatcher is strong and in fact is one of the better aspects of the film. Carrell does a great turn as Du Pont and there is no trace of The Office or his often saccharine filmic work. Instead he is sombre, controlled, and he articulates Du Pont’s hermetic life carefully. There is a real sense that we get to know who Du Pont is throughout the film and that all comes from Carrell. But he’s not the only one to shine and Channing Tatum bounces of Carrell with skill. In this pairing director Bennett Miller has found something special. There are many similarities between Foxcather and Miller’s earlier film Moneyball (2011). Both are based on true stories and both revolve around two men and their interactions with one another. However Foxcatcher has a darker edge. There is something in the world that doesn’t quite sit right and it takes the whole film to understand what that is. The sadness inherent in Foxcatcher comes from the fact that our two ‘heroes’ are very lonely men. They don’t have close family relationships (aside from Dave), they don’t make friends easily, and they both struggle to define who they are. It takes some big changes for both of them to find themselves and the unpleasant truth is that we’re not always who we think we are, or at least who we hope to be. We are defined by our actions and the final moments of the film show just how different our life can become when compared to our expectations. We have an obligation to ourselves to act kindly and with consideration however sometimes we all slip up, and sometimes things don’t transpire as we would like them too. In this Foxcatcher explores some bigger issues but with a tight focus on the lives of two men and the point where they intersected. Du Pont finds that he is capable of changing his legacy and Mark finds that he still has time to create his. Foxcatcher is a film about two men but of course it’s bigger than that. It is a taught, considered, and well made piece about people and their emotions. We are all capable of greatness but it seems that we have to strive for it. The key is honesty and the acceptance that we can’t always be who we want to be. This is an immersive film and one that has more to do with a metaphorical idea of wrestling than with the sport itself. We have to fight our desires, sometimes we have to fight so that we can change our lives, and sometimes we lose. But every time we fall we have the choice to pick ourselves back up. Foxcatcher suggests that not everyone manages to find their feet again but some do.